Of those states taxing wages, eight have single-rate tax structures, with one rate applying to all taxable income. Conversely, 33 states levy graduated-rate income taxes, with the number of brackets varying widely by state. Hawaii now has 12 brackets, the most in the country. Forty-three states levy individual income taxes. Forty-one tax wage and salary income, while two states—New Hampshire and Tennessee—exclusively tax dividend and interest. Seven states levy no income tax at all. Tennessee is currently phasing out its Hall Tax (income tax applied only to dividends and interest income) and is scheduled to repeal its income tax entirely by 2022. Of those states taxing wages, eight have single-rate tax structures, with one rate applying to all taxable income. Conversely, 33 states levy graduated-rate income taxes, with the number of brackets varying widely by state. Kansas, for example, imposes a two-bracket income tax system. At the other end of the spectrum, two states—California and Missouri—each have 10 tax brackets. Hawaii has 12 brackets. Top marginal rates range from North Dakota’s 2.9 percent to California’s 13.3 percent. In some states, a large number of brackets are clustered within a narrow income band; Georgia’s taxpayers reach the state’s sixth and highest bracket at $7,000 in annual income. 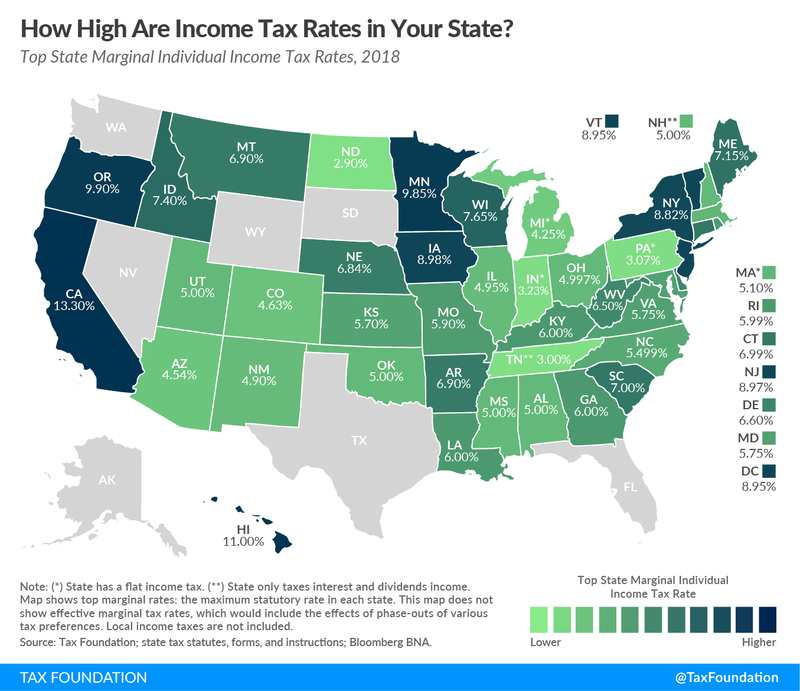 In other states, the top marginal rate kicks in at $500,000 (New Jersey) or even $1 million (California, when the state’s “millionaire’s tax” surcharge is included). Following the 2017 federal tax reform, it remains to be seen if states that are coupled to the federal standard deduction and personal exemption will maintain that conformity or rather retain their previous deductions and exemptions amounts. The federal bill increased the standard deduction to $12,000 for single filers, but eliminated the personal exemption. Mississippi began phasing out its 3 percent individual income tax bracket by exempting the first $1,000 in income. The bracket will be fully phased out by 2022. Maine repealed the 3 percent income tax surcharge on earnings over $200,000 approved by voters in November 2016. U.S. Census Bureau, “State & Local Government Finance, Fiscal Year 2015.” http://www.census.gov/govs/local/. Tennessee Department of Revenue, “Hall Income Tax Notice,” July 2016. https://www.tn.gov/content/dam/tn/revenue/documents/notices/income/16-05Hall.pdf. Jared Walczak, “Tax Reform Moves to the States: State Revenue Implications and Reform Opportunities Following Federal Tax Reform,” Tax Foundation, January 31, 2018. https://taxfoundation.org/state-conformity-federal-tax-reform/. 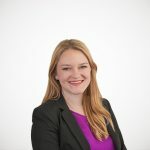 Kari Jahnsen, ”Hawaii Hikes Income Taxes to Pay for Earned Income Credit,” Tax Foundation, July 24, 2017. https://taxfoundation.org/hawaii-income-taxes-earned-income-credit/. Joseph Bishop-Henchman, “Mississippi Approves Franchise Tax Phasedown, Income Tax Cut,” Tax Foundation, May 16, 2016. https://taxfoundation.org/mississippi-approves-franchise-tax-phasedown-income-tax-cut/. EY Tax News Update, “Maine 3% income tax surcharge repealed — revised withholding tables are effective immediately,” August 2, 2017. https://taxnews.ey.com/news/2017-1262-maine-3-percent-income-tax-surcharge-repealed-revised-withholding-tables-are-effective-immediately.